"I host many parties a year, and now I would never consider using any caterer but Buccarelli's; their dishes are imaginative yet practical, sumptuous yet affordable, and they deliver it all on time and with Italian warmth and good cheer. I cannot recommend them highly enough!" You did a wonderful job. The food was great and we were complemented several times. From the first consult with you to the final skewer of mozzarella, you and your staff were polite, professional, and most of all perfect in the preparation of the food. Since that was my first and I have two more weddings coming you can be assured you will be hearing from us again, soon I hope. I have had two events catered from Bucciarelli's, a First Communion, and a 50th birthday party. Both went off without a hitch! The food was excellent and Judy was fantastic to work with. I would recommend them to anyone. Bite size pieces of sweet ripened cantaloupe or honeydew melon wrapped in a thin slice of Imported Prosciutto for the perfect sweet & salty taste. Bite size mozzarella balls wrapped in a thin slice of Imported Speck, a smoked and cured Italian ham (melon balls can be substituted for mozzarella balls). Thinly sliced Imported Proscuitto wrapped around tender roasted asparagus spears. A traditional Italian dish of crispy fried risotto balls with a cheesy filling. 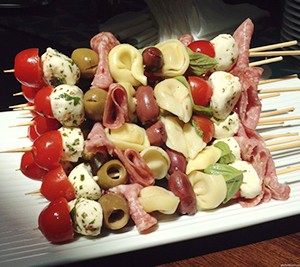 Individual skewers of marinated Key West Chicken pieces, mozzarella balls, cherry tomatoes and basil. Grilled bite size piece of marinated tip with onion, red and green peppers. Fine selection of imported and domestic dry cured meats accompanied with olives and peppers. Fine selection of imported and domestic cheeses accompanied with olives, peppers and crostini crackers. 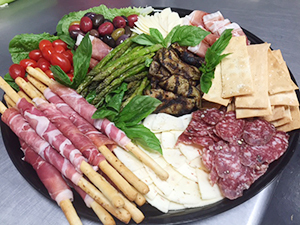 Traditional Italian Antipasto platter of dry cured meats, cheese, olives, marinated mushrooms, artichokes, asparagus and peppers. Selection based on seasonal availability. Freshly baked baguettes topped with spicy olive tapenade, mushroom tapenade, or fresh tomato, garlic, basil. Baby portabella mushrooms stuffed with spinach, red peppers, breadcrumbs, garlic and fets cheese. Bite size mozzarella balls, grape tomatoes and basil, tossed in an Italian vinaigrette. Italian seasoned chicken cutlets layered in marinara sauce and topped with mozzarella cheese. Pasta sheets layered with your choice of ricotta cheese, meats, or vegetables in our delicious marinara sauce. Tender pieces of boneless chicken breast and broccoli sautéed in olive oil and garlic then tossed with ziti and parmesan cheese for a light and tasty dish. Extra large shrimp sautéed in a garlic, white wine and butter sauce tossed with your choice of pasta. Tender pieces of boneless chicken breast sautéed in a sweet Marsala wine sauce and tossed with Imported Italian Proscuitto, mushrooms and onions. Your choice of pasta with our homemade Marinara sauce. Your choice of pasta sautéed with a seasonal selection of vegetables in a light tomato, garlic, parmesan sauce for the perfect vegetarian option. Our homemade meatballs simmered in our homemade marinara sauce. Boneless breast of chicken topped with cherry tomatoes, fresh mozzarella and basil , finished with a balsamic glaze. Our popular house-seasoned roast beef, slow cooked, thinly sliced and topped with rich beef gravy. Oven roasted lemon-pepper marinated chicken quarters topped with caramelized lemon slices. Tender beef pinwheels, stuffed with spinach and provolone cheese. Individual pork chops, stuffed with your choice of Italian Herb Stuffing or Apple Cranberry stuffing. Tender Beef filets stuffed with a selection of Italian meats and cheese, rolled and simmered in marinara sauce. Large pearled couscous tossed in olive oil and lemon juice with shallots & parsley. An elegant and simple side dish. Green beans cooked until tender crisp and tossed with toasted sliced almonds. Butternut squash roasted with dried cranberries, pecans, brown sugar and cinnamon. Your choice of our popular oven-roasted chicken wings -hot, teriyaki or key west marinated. A traditional Italian favorite of our popular sweet Italian, garlic & cheese or hot sausage sautéed with red and green bell peppers & onions. Our delicious steakhouse marinated steak tips, sautéed with red and green bell peppers & onions. Mushrooms can be added for an extra charge. Pork seasoned in our house special rub then slow cooked and finished with our signature barbeque sauce. Top it off with our cole slaw for the ultimate sliders. Sweet corn kernels sautéed with bacon, red pepper flakes and scallions make a delicious smoky side dish. A huge customer favorite! Broccoli florets tossed with cherry tomatoes, red onion, feta cheese in our creamy Greek dressing. Orzo and cherry tomatoes tossed in our homemade basil pesto sauce. Pasta tossed with shredded carrots, cucumbers, red peppers, green peppers and black olives in an Italian vinaigrette. Your choice of Italian specialty sandwiches, Boars Head cold cuts or chicken salad on your choice of breads (ciabatta, multi-grain ciabatta, Italian stick, wraps, snowflake rolls), accompanied by your choice of toppings and condiments (lettuce, tomatoes, pickles, onions, hot banana peppers, roasted red peppers, carmelized onions, hot pepper relish, mayonnaise, chipotle mayonnaise, mustard, honey mustard, Dijon mustard). 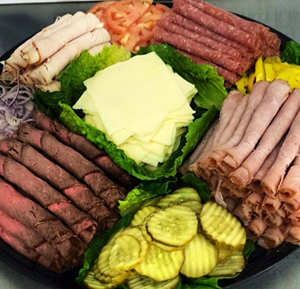 Sandwich platters can be customized to accommodate any type of corporate event. 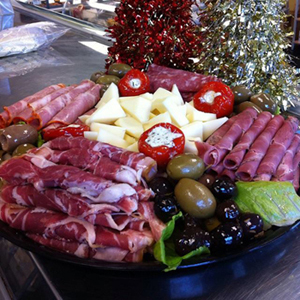 A fine selection of Italian cold cuts, Boars Head cold cuts, Imported and domestic cheese. Pork seasoned in our special rub then slow cooked and finished with our signature barbeque sauce. Top it off with our cole slaw for the ultimate sliders. Our delicious steakhouse marinated steak tips, sautéed with red and green bell peppers & onions. Mushrooms can also be added. Our popular potato salad made with red bliss potatoes and bacon…a real crowd pleaser. Elbow macaroni dressed in a our creamy dressing and seasoned with dill. A variety of domestic and imported cheese accompanied with our selection of sea salt crackers and crostinis. 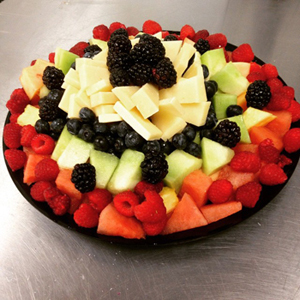 Fruit and/or olives added to complete this satisfying platter.